As our region continues to evolve, it’s important that we understand the pressures our environment faces and the changes that are happening. A growing population, changing land use and a booming economy have all had an effect on Tauranga Harbour, and there are a few issues we are working with our communities, iwi and hapū as well as local industries to resolve. Sea lettuce is a naturally occurring green algae (seaweed) native to New Zealand. There are about five different species of it in Tauranga Harbour. It can cause problems for the community when it grows during summer months and is deposited on beach and foreshore areas in large quantities. Tauranga Harbour, with its shallow flats and channels, has plenty of nutrients and good water clarity for photosynthesis; perfect for sea lettuce growing conditions. When sea lettuce 'blooms' it affects the way the harbour looks, and how we use it. Sea lettuce gets ripped off the sea-bed by strong on-shore winds or heavy seas. It can drift around the harbour and nearshore coastal waters and interfere with fishing nets and lines. It can also affect commercial shipping at the Port of Tauranga, wrapping around ship propellers and blocking cooling water intakes. Student Jamie Lynds investigates sea lettuce in Tauranga Harbour. Sea lettuce at Tuapiro Spit. It keeps growing as it floats around and then gets washed up on the beaches with on-shore winds. Decayed sea lettuce produces an offensive sulphur odour. When washed up piles of sea lettuce decompose on the beaches or in shallow areas, more nutrients are released into the harbour system and sea lettuce growth is promoted. Sea lettuce varies in abundance from year to year and place to place. Its presence is most strongly influenced by uncontrollable factors such as wind, tides and coastal currents which affect water temperature and natural nutrient levels. Reduce diffuse nutrient sources such as from agricultural runoff and nutrients that drain through the soil and into groundwater which eventually enters the harbour. Prevent point sources of nutrients such as from septic tank seepage and storm water drains. 2. Investing in research to further understand the problem and identify viable management options. 3. Reducing the public nuisance factor and hydrogen sulphide risk by working with Tauranga City and Western Bay of Plenty District Councils to remove sea lettuce from high use public areas around the Tauranga Harbour. Wherever possible, the sea lettuce is rinsed, dewatered and taken to a commercial composting facility where it’s washed and processed along with other green waste. In the rare instances that the collected sea lettuce is too badly decomposed, contaminated with sand or there’s too much of it for the compost facility to handle, it may be disposed of to landfill. You can help manage sea lettuce by collecting it from the foreshore and using it as a fertiliser or compost supplement inyour garden. Wash it and use it sparingly to avoid salt build-up in your soil. Find out more in this Sea Lettuce and the Garden booklet, produced by Tauranga HarbourWatch Inc.
Video: First Tauranga Harbour sea lettuce clean up for 2016/17 summer. Video: Our contractor is collecting beach cast sea lettuce from the Matua/Otumoetai foreshore today (13 Jan 2017). There are 70 species of Mangrove found worldwide. In New Zealand only one species is present, Avicennia marina Subspecies Australasica or Manawa, which is native to New Zealand and has inhabited New Zealand coastal environments for approximately 19 million years. The Manawa species is the most southerly growing species in the world. Mangroves play an important role in the ecology of the Tauranga Harbour by helping to reduce coastal erosion and providing an important habitat for some marine species. They provide a buffer against coastal erosion and storm surge and are a nursery ground for some juvenile fish species like short finned eel and yellow eyed mullet. They're also home to many native insects, birds, shellfish, snails, crabs and algae. However, too many mangroves can create problems in the harbour. Changing the way we use land in the Tauranga harbour catchment has caused more sediment and more nutrients to get into the harbour. This includes activities like subdividing land and clearing land of bush. The extra nutrients have caused more mangroves to grow to the point where they've taken over large areas of the open tidal flats, especially in the sub-estuaries ( i.e Te Puna, Waikareao and Waimapu estuaries). Council is working with landowners to reduce sedimentation which exacerbates mangrove spread. We also support Estuary Care groups in their restoration work. We have commissioned an innovative new solution to reducing mangrove spread in Tauranga Harbour. Regular hovercraft operations started in March 2017, operated by trained pilots in 11 of Tauranga Harbour’s estuaries, removing up to 600 hectares of mangrove seedlings from consented areas each year. Watch a video clip of the hovercraft in action during trials at Athenree. Video: Mangrove seedling mower hovercraft during trials in Tauranga Harbour. Sedimentation of Tauranga Harbour is a natural process, however the rate of infilling has been increased by human activities on land associated with development. Increased sedimentation affects many aspects of life in the harbour. Navigational channels have shallowed, mangroves have increased and there is evidence of ecological losses such as with eel grass beds, juvenile fish areas and shellfish beds. The average mud content of many of the western estuaries, including Welcome Bay, Waimapu Estuary and the Waikareao Estuary in particular, has increased significantly. These changes are largely driven by historical events, such as when development took occurred around the harbour with very few controls in place. We are developing and testing new sediment control trials to reduce sediment run off from farm land. We are developing and testing new ways to reduce sediment run off from farm land. Check out this video from one of our trial sites where a bund and dam have been installed to capture storm water from the surrounding hill country and separate the mud out before it runs off into Tautau Stream and the Tauranga Harbour. Video: Reducing sediment run-off into Te Awanui Tauranga Harbour. New Zealand's only native species of sea grass, Zostera capricorni, is a flowering marine plant which colonises soft sediment in estuaries and some coastal rocky platforms. The plant is very hardy and able to tolerate both low and high salinity (salinity refers to salt content of water) waters, and being exposed to the air at low tide. Sea grass beds are declining worldwide, including New Zealand, an issue that is hard to fix as they do not re-establish easily. Sea grass at Ongare Point. Sea grass, Bay of Plenty. Stabilising the sea bed and preventing erosion. Providing food and shelter for estuarine animals including juvenile fish and water fowl. Increased habitat complexity and hence species diversity. Sea grass beds are declining worldwide, including in New Zealand, and are hard to fix as it does not re-establish easily. The aerial photo below shows where sea grass was previously abundant in Tauranga Harbour and is now gone. It is estimated that within the whole harbour, 34% of the sea lettuce was lost between 1959 and 1996. In some areas of the harbour up to 69% was lost over this 37-year period. Areas near the harbour entrance with little land runoff or influence from other catchments have shown the smallest decline in seagrass abundance. 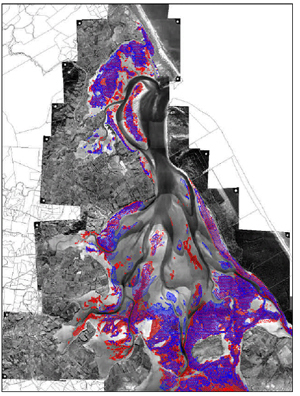 This image shows Northern Tauranga Harbour and the presence of seagrass in 1959 (red) and 1996 (blue). The decline is linked to higher suspended sediment rates in the water which blocks out the available light the sea grass needs to survive. Higher nutrient rates in the water column are also related to the decline as higher nutrient levels result in the growth of algae in the water column which also block the amount of available light. Reclamation of the sea bed. Dredging which removes plants and also increases suspended sediment in the water column. Physical disturbance from vehicles, boats, structural works and people. Exotic species including the black swan which grazes the sea grass beds and removes patches up to 1m in diameter. Damage to sea grass beds from swan grazing.